After that heartbreaker/miracle of a game last night (depending on your allegiance), it was tough to settle down. While the Patriots spend this morning sleeping off their victory celebrations, and the Falcons nurse their drowned sorrows, the rest of us had to get up and get back to reality—bleary-eyed reality. Days like today—when just the thought of getting out of bed is a nightmare (thanks, unprecedented overtime! )—make it abundantly clear how important a good night’s sleep is. 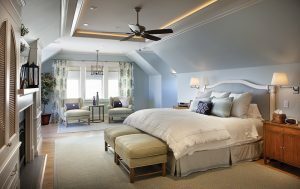 Here at Design NJ, we know that a major factor in achieving a restful night is a comfortable, relaxing bedroom. In our line of work, we see a lot of great bedrooms. Here are just a few. We all get enough stimulation during the day, don’t we? Neutral bedrooms like this one are the antidote to frenzied days. 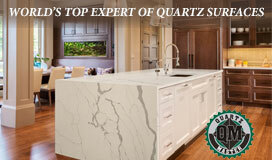 An understated palette with just the barest hint of color is soft, soothing and comforting. Or perhaps pops of bright color suit your style. 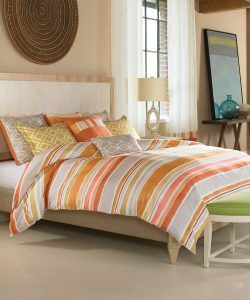 The cheerful stripes on this bedding add a bright note to mornings and offer an upbeat attitude at the end of the day. A plethora of pillows on a generously proportioned bed looks inviting and luxurious. Monochromatic rooms provide a blissful sense of ease for the eyes. The single palette enhances the feeling of being cocooned in warmth and comfort. 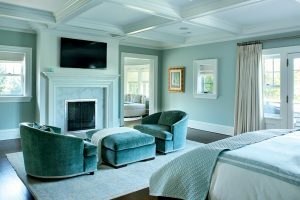 A soothing atmosphere goes a long way in a bedroom. Because even when it’s not Superbowl Monday, we all seem to be exhausted and tense nowadays. So it pays to invest in some luxurious accouterments to a good night’s sleep.